The politics of the The Kansas Experiment were recounted in Sunday’s NYT Magazine. Does the economic crash continue? The Kansas stall is placed in National context in Figure 1, using the Philadelphia Fed’s coincident indices, normalized so both Kansas and US economic activity are at 0 at 2011M01, when Governor Brownback takes office. Figure 1: US coincident index (blue) and Kansas (red), both in logs, normalized to 0 in 2011M01. Observations for December 2015 are forecasts implied by leading indices. 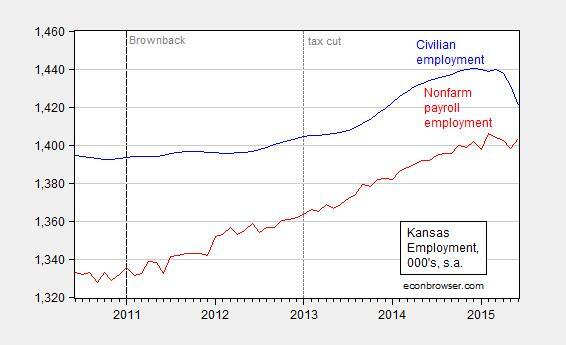 Dashed lines at Brownback (2011M01), and tax cuts (2013M01). Source: Philadelphia Fed coincident, leading indices, June releases. The decline shows up regardless of whether employment is measured using the establishment or household surveys. Figure 2: Kansas nonfarm payroll employment (red), and civilian employment (blue), 000’s, s.a. 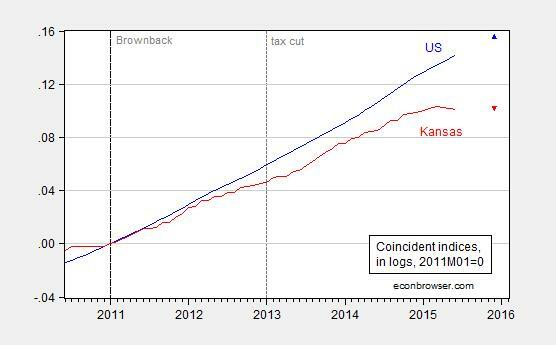 Dashed lines at Brownback (2011M01), and tax cuts (2013M01). Source: BLS. Some have argued the recent decline is due to drought. Drought does not seem to be an explanation to me. 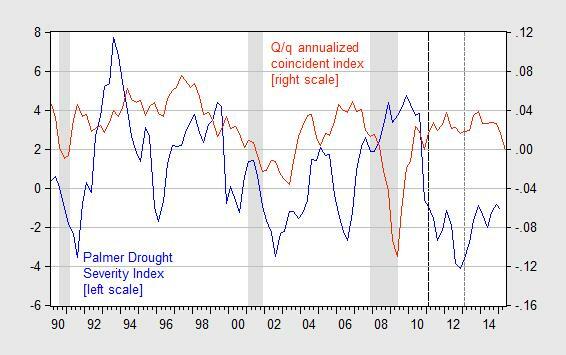 Figure 3: Kansas Palmer Drought Severity Index (blue, left scale), q/q annualized growth in Kansas coincident index (red, right scale). Dashed lines at Brownback (2011M01), and tax cuts (2013M01). Source: Philadelphia Fed coincident, NOAA. Yet others have asserted that the negative shock to aircraft demand explains the lackluster growth in Kansas. Evidence from employment data is not supportive of this thesis, as shown here. I would argue much of the downturn especially post January 2013 is self-inflicted, due to the fiscal policies implemented, as described in the NYT Magazine article. This entry was posted on August 11, 2015 by Menzie Chinn. The KC Fed publishes a “regional databook”. here. 1. With the exception of “private educational services”, whatever that is, no employment category shows a meaningful increase above trend and most are flat. So for example, “financial activities” and “professional and business services” have continued to add employees at roughly the same rate since 2010 – picked those because they’re the only decent gainers. There has been no positive or negative effect from the Brownback changes other than in “Mining and Logging” and “Retail Trade”, both of which have turned noticeably down. 2. One can point to low unemployment rates but there’s a fairly recent, fairly sizable drop in the size of the work force, so the rate looks better than it really is. 3. The total non-farm index of growth has developed a flat trend as the national non-farm index has continued an upward trend. This is as Menzie has repeatedly noted. I don’t look at the KC Fed material very often because it tends, to me, to rely too much on graphs. I hate having to check the vertical axis for each graph to see what they’re counting – as in, one graph is from 80 to 120k and the next is from 90 to 105. Seems to run in the family. It might be helpful to see similar data on, say, Wisconsin/Minnesota/US. Kansas…home to 6,000 ghost towns. “What’s the matter with Kansas?”is something I am hearing more and more recently. That phrase should be on the license plate. It would cheer everyone up! Especially taken in conjunction with medical marijuana. The article is actually very good if you read it from a long-term perspective rather that a get-rich-quick perspective. We all know that government “growth” statistics are weighted toward counting government expenditures the same as productive expenditures so they are of questionable value when making entrepreneurial decisions. What the article revealed is that Kansas has been losing population for decades because of its lack of increased business diversity. Brownback was elected as the leader who would bring real investment into Kansas. Those Republicans who support Brownback know that such changes of culture take many years. But they have a very clear goal, transform Kansas from a tax-on-production state to a tax-on-consumption state. In theory this will increase business investment in Kansas and grow private sector jobs. Menzie’s figure 2 gives a good graphic of what is happening. While civilian employment is declining due to reductions in government employment the non-farm payroll continues to increase. This has a double impact on economic health, harkening back to the Clinton welfare reforms. Government expenditures decline and the non-productive government workers find productive work. Government workers shift from a parasitic role to a contributing role. It is a bold experiment for sure because it will take time to become effective. I encourage you to read the article with this in mind. Ricardo: You really should consult data before making assertions; Kansas population growth accelerated from 2006 through 2010. It then decelerated drastically starting in 2011. You don’t even have to consult data. Just google “Kansas population” and an interactive graphic appears. Kansas population growth has been happening since 1945. The only declines I could find were in the late 1930s and early 1940s. I am always amazed that conservatives who sell their policies as providing quick results: “adrenalin shot to the heart” (Brownback) or “[jobs] taking off like a rocket ship” (Walker), always revert to the well-these-things-take-a-long-time-to-work position when the promised economic boost fails to arrive. Somehow their ideology doesn’t allow them to see that taking money from people with a high propensity to spend and giving it to people with a high propensity to save may have a impact on demand whether local, regional or national. But now it’s too late for Kansas; falling employment prospects, a disintegrating transportation system, and a school system critically short of teachers is driving away young families especially in Western and Central Kansas to Colorado–much the same as young people in Northern and Western Wisconsin are heading for Minneapolis/St. Paul. I called Gene in January, as this year’s legislative session began in Topeka. For a Kansan, and a Suellentrop, Gene is a talker, but if you met him you would probably find him a little bit reserved, although not taciturn. On this call, he sounded worried. ‘‘People are leaving Kansas,’’ he told me. The state has no mountains and no beaches, and thousands of jobs that were lost during the Great Recession, especially in Wichita’s aircraft industry, never returned. The march to zero, which includes an already-passed provision that exempts the owners of 330,000 businesses and farms in Kansas from income tax, was designed, Gene said, to turn Kansas into a different sort of tourist attraction. As he and his fellow conservatives see it, it’s an ‘‘open for business’’ sign, one they hope will draw free enterprise to the state, perhaps akin to the way the national debate over the expansion of slavery once drew young abolitionists from New England to the plains. At the very least, they hope it will prevent young people and existing businesses from moving elsewhere, to places with ski lodges or surf shops. Ricardo: Did you or did you not mention “population”. All I did was falsify your assertion. I feel like I could add some perspective. I was a Kansan–born and raised–and I left the state in 2012. Overland Park and the KC Metro are about the only bright spots, along with Lawrence. Even with an MBA and a few years experience in the workforce I still found it virtually impossible to find any decent job in Wichita that paid more than $30-$35K a year. I left for OKC and found a job right away making $45K there and now live in Washington State making around $60K. My wife is a CPA and her income went up by $35K just by moving one state South. Granted, Oklahoma is also ran by the same types that run Kansas, but they didn’t overplay their hand like Brownback. They’ve enjoyed an influx from North of the border too. I thank god for every day that I don’t have to spend in that dump of a state. Everybody I know there–family and friends–are miserable and angry. I realize these are anecdotes and not raw data, but Ricardo is living in a fantasy land. Menzie, I did misstate by using the word “population.” I should have simply repeated the article. Yes the amazing thing is that these “business friendly” politicians fail to understand that the main thing that will attract businesses and induce growth, is costumers. Driving all the border town inhabitants to shop in another state by increasing Kansas sales taxes is not good for business. Reducing the quality of education is not going to make Kansas attractive for new businesses whether their owners have children or not. To attracts talent it is not a great thing for a business to reside in a “low everything” dump of a state. Really Ricardo, a quote from some guy in Kansas in a Times article is your source? Really? Maybe when he stops beating his wife, he’ll have something more productive to add. Why look at Kansas or Wisconsin when discussing conservative economic experiments? Especially since you are looking at things since 2011, which is too short of a time period. Wisconsin’s state tax level is still very high, and government employment was outpacing the US average as of the March data (the last time I looked at it). You should be looking at Colorado. Most people don’t realize that Colorado is one of the most economically conservative states in the country, even when Democrats control the legislative and executive branches. This is because of the Taxpayer Bill of Rights (TABOR) that was passed in the early 90s, way before 2011. TABOR restricts government revenue/expenditure growth to a pre-set amount (a formula based on population and inflation increases), and forces any revenue/expenditure above and beyond that to be approved by taxpayers (which virtually never happens). The result has been a diversification of the economy and, I think, a healthier economy, all the while maintaining a relatively low 4% state tax rate. So while the data you show definitely suggests that Walker and Brownback’s performance are not good, and in the case of Walker it should probably go against him in his presidential bid, it should not sway anyone to be less economically conservative. If Colorado under performs, though, the argument for becoming more liberal would be much stronger. Anonymous: Well, maybe it’s just my reading of the data, but as Colorado’s ranking by ALEC-Laffer has fallen from 2nd in 2009 to 22nd in 2014, growth has risen from -1.4% to 4.6%. That is, the less “business friendly” according to ALEC-Laffer, the faster growth. Just an observation…. Do you trust ALEC-Laffer’s ratings? Why would they possibly have an equal weighting for their 15 variables, that is absurd! But regardless, that is not how you are looking at Wisconsin or Kansas. Your charts/regressions compare state-level employment growth to the US. To compare apples-to-apples, shouldn’t you do the same with Colorado? Colorado’s policies are very conservative (so much so that liberals are trying to have the Supreme Court throw out TABOR) – it looks like ALEC-Laffer (not sure how robust their model is) is penalizing Colorado for things that likely do not have large effects on employment growth: right to work, minimum wage, increased taxes in ’13/14 (25 cents per $1000 earned, I mean come on, what is this going to affect?) and debt service. I’m glad you brought up “Rich States, Poor States” (I assume the 8th edition, 2015). Mr. Laffer, despite all the rational evidence to the contrary, has ranked the Midwestern states thusly in 2015 for their “business prospects”: Indiana 3rd, Wisconsin 13th, Ohio 23rd, Michigan 24th, Iowa 25th, Illinois 40th and Minnesota 48th (yes, MN second worst business prospects in the entire country). And had the publication given recognition to Wisconsin’s new shiny right-to-work status (which Laffer scores as either 1st or 50th since it is a binary value data point in the mirror-world of his analysis) the state might have risen to 10th. Is there any reputable (or even less than reputable) analyst, anywhere, (other than the cornucopia of misinformation that is Mr. Laffer) willing to state that Wisconsin’s business prospects overwhelmingly outshine those of Minnesota? And since Laffer’s comic book of business prospects lists former scores it is very interesting to note that while Wisconsin has dropped into the teens for rankings over the past three years, Minnesota has never fallen below 37th; yet by all measures it continues to do measurably better than the Badger State. I’m assuming Laffer’s conclusion about this apparent disconnect is that either: a) well it takes a long time for his favored policies to work (maybe spanning generations at times); or b) the figures for employment, state GDP, wages, and per capita income are all being manipulated by the federal government to embarrass him.